CM Magazine: The Ice Bear. London, Eng. : Frances Lincoln Children's Books (Distributed in Canada by Publishers Group Canada), 2010. In the beginning of time people and animals lived together on the earth and there was no difference between them. Bear, human, raven, fox, even snow and ice, all had spirit, all had soul. The air was pure and clear as crystal. Words held a magic. A word spoken in a chance, a wish or a whisper would hold a magic that would shape the world. Into this world they were born, in the dark months, when the cold and the wind turned water to stone. So small. She held them close to keep them warm in the blue ice cave that was their world. But Raven tricked her. She stole away one child, carried him high into the darkness of winter, over the frozen sea. The bear wept when she found that her cub had gone. Her ice tears formed scars on her cheeks. She held her one child safer and closer and waited for the sun to rise. A mother polar bear gives birth to two cubs. She is heartbroken when Raven steals one away. Elsewhere, a hunter is returning home when he comes across the bundle that Raven has left in the snow: a child. 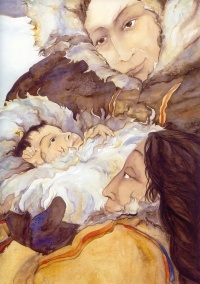 The parents love and care for the child for seven years, with Raven watching over him from afar, until it is time to reunite him with his bear-mother. The child follows a trail of amber � being led by Raven, of course � until he is separated from his human family and is lost. That is when the bears find him. He's certain that he will die, until he is recognized as "brother." His father, searching, comes upon the traces of his son and the bears. Thinking that his son is dead, the father vows to kill the bear who took his son. He nearly does so, but his son steps between him, and "Raven's cry broke the spell of bloodlust." Torn between his two families, the boy decides to divide his time between them, and he is given the ability to shape-shift, thus uniting the animal and human world. "One spirit, one heart, one soul, one people." 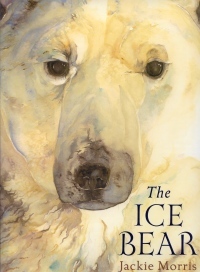 Written in a style evocative of mythology or folklore, the story of Ice Bear is about respect for the natural world. That Morris has to set it in the beginning of time is a reflection on how far we have strayed from that feeling of connectedness. Unlike traditional myths or legends, which usually have a clear moral, lesson, or explanation of the world, Morris does not explicitly state what the reader is meant to take away from the book. It is never made clear why Raven takes the bear cub, beyond being an established trickster in many cultures, nor why it is Raven who brings the boy back and who breaks the spell. For that reason, despite the picture book format, the story is more suitable for an older audience. The real strength of Ice Bear is in its illustrations. Jackie Morris uses watercolours to evoke the cold, harsh climate of the Arctic as well as the warmth of familial bonds. There is texture and detail in every brush stroke. Ice Bear is the kind of picture book that adults love: impeccably detailed and artistic illustrations, paired with poetic prose, reminiscent of classic folklore or fairy tales. Whether it will have as broad appeal to children remains to be seen. It should be part of any school or library collection so that they have the opportunity to discover it. Barb Janicek is a children's librarian with Kitchener Public Library, in Kitchener, ON.